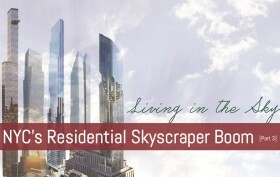 We recently brought you parts one and two of our tallest residential skyscrapers series, which totaled 63 projects poised to scrape the sky. But this list doesn’t even take into consideration the development boom occurring in Jersey City, unreleased plans on the drawing board, and the numerous office and hotel projects also rising throughout the city. So here you have it, part three of the series to complete our look at NYC skyscrapers.